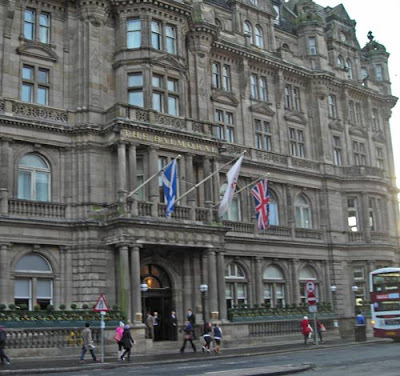 Today we went to Edinburgh for a Spa Day at the Balmoral Hotel. 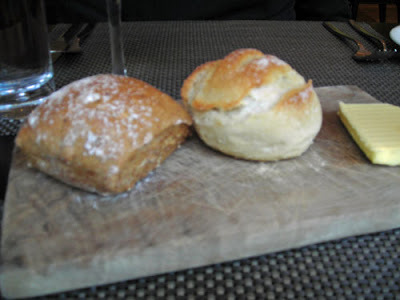 This was a Christmas present from my Mum and included lunch in Hadrian's Brasserie. The Spa is superb and the treatments were excellent, it's not cheap, but is a lovely treat. Apologies for the quality of the photos, I didn't want to take my DSLR with me so took the little Nikon L2. It reminded me why I upgraded! This is the menu which you probably can't read, the two course lunch was included in the Spa Day Package. 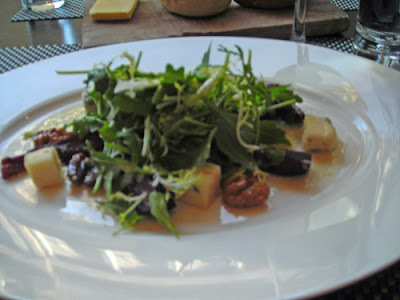 Brian chose the Lanark Blue Salad with Walnuts and Pear which he enjoyed, the pear was red, we weren't sure if it had been marinaded in something or was a red pear! I had the Roast Pumpkin soup with Parmesan Croutons, it was very smooth although I thought it could had done with a little more seasoning. The starters were served with a wooden platter of rolls, in fact they brought us a second serving of rolls, they were very nice although a little chewy. 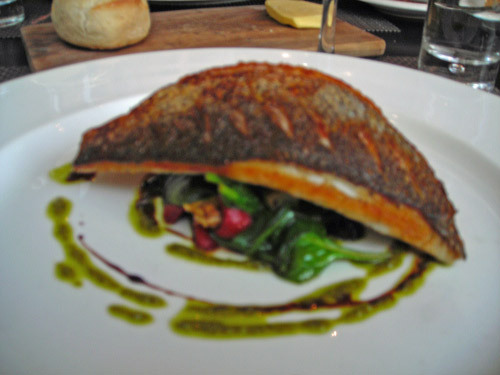 We both chose the Sea Bream with wilted spinach, red pepper, baby artichokes and salsa verdi. Now this was really delicious, the skin was crips and the flesh was perfectly cooked, the vegetables and sauce were also excellent. Overall, I felt the menu was overpriced and although the food was very good and the service was very attentive, I don't think it was good value. 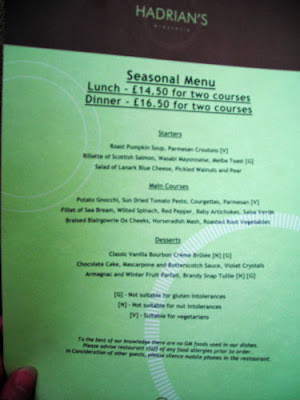 I stayed over at the Carrick Lodge Hotel in Ayr last Monday night and had a superb meal with excellent service that was a much better deal. Brian's salad is similar to a tart I make Janice. I bet he'd like that too. 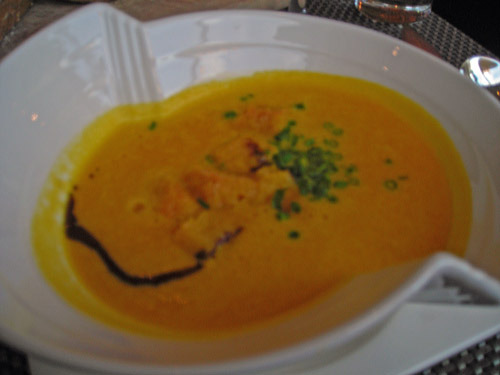 The soup sounded lovely but why do they have to have such peculiar shaped dishes? lol Your fish is very similar to what we had for dinner last night! it all looks very nice,but i'm not sure i'd like a wooden chopping board with all those cuts on it for all the little germans to hide in !!!! What a fabulous present! Bet the spa was brilliant and ideal for this time of year. Interesting review, Janice - I can't blame you!